Can the end of daylight saving time help you make up for lost sleep? This weekend marks the end of daylight saving time, as the clocks "fall back" an hour at 2 a.m. Sunday, presumably giving the millions of sleep-deprived Americans an extra 60 minutes of shut-eye. But can an additional hour on Sunday help make up your sleep deficit? Yes, experts say, but only if you're really using that time to sleep. "For most people who are sleep deprived, getting an extra hour of sleep can actually be very helpful," Dr. Shalini Paruthi, director of the Pediatric Sleep and Research Center at Saint Louis University and fellow of the American Academy of Sleep Medicine, told CBS News. To make sure you're using the extra hour to actually sleep -- and not binge-watch an extra episode of your favorite TV show or peruse social media on your phone -- Paruthi recommends not changing your clocks until you're ready for bed and going to sleep at the same time you normally would. Setting an alarm to wake up at your regular time is also key. But for the chronically sleep deprived, an extra hour still might not be enough. "When some people get more sleep, they say that they actually feel even groggier," Paruthi said. "But that's their body telling them that they have not totally caught up on their sleep." The National Sleep Foundation recommends adults get seven to nine hours of sleep per night. But according to a government-funded survey, nearly 30 percent of Americans get an average of six hours of sleep or less and the Centers for Disease Control and Prevention has recognized insufficient sleep as a "public health epidemic." Other studies suggest quality of sleep, as opposed to quantity, may be the real issue. A 2014 poll from the National Sleep Foundation found that many of those surveyed did in fact get the recommended number of hours of sleep per night -- with an average of 7 and a half hours -- but 35 percent reported their sleep quality as "poor" or "only fair." Twenty percent said that they did not wake up feeling refreshed on any of the past seven days. A new small study published in the journal Sleep suggests that awakening several times throughout the night is more detrimental to people's moods than getting a shorter amount of sleep without interruption. "When your sleep is disrupted throughout the night, you don't have the opportunity to progress through the sleep stages to get the amount of slow-wave sleep that is key to the feeling of restoration," the study lead author Patrick Finan, Ph.D., an assistant professor of psychiatry and behavioral sciences at the Johns Hopkins University School of Medicine, said in a statement. Experts say people often have trouble determining whether they're just feeling a bit tired or whether they're really sleep deprived. Symptoms of sleep deprivation include trouble focusing during the day, getting easily distracted, feeling irritable or depressed and nodding off during sedentary activities like reading, watching TV or sitting in a meeting. And certain habits may be so engrained in our daily routines, we may not even realize that they're signs of sleep deprivation. 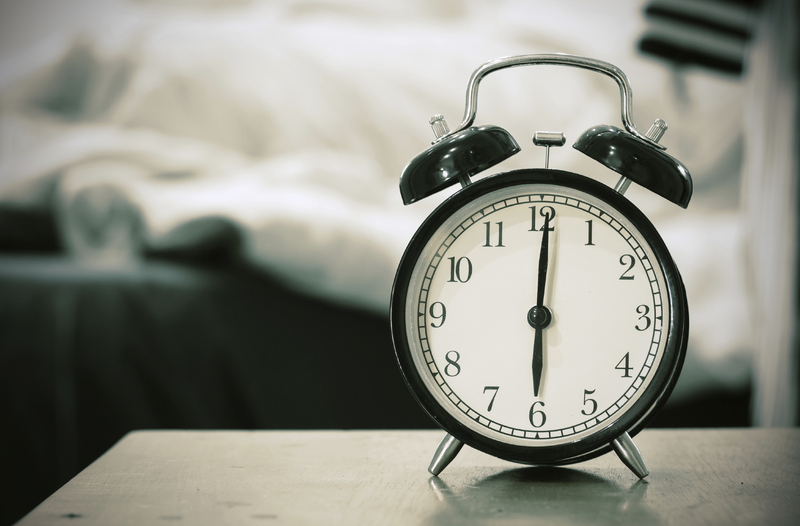 "People who really depend on their alarm clocks to wake up in the morning and people who are dependent on caffeine to stay alert and productive during the day, those are also big signs they're not getting enough sleep," Paruthi said. "Also, if people find themselves catching up on sleep by sleeping in late or sleeping longer on the weekends, that's another sign." To get back on track, experts recommend going to bed at a consistent time every night -- including the weekends -- and establishing a regular nighttime routine. "Whether it's showering and getting into pajamas and reading a book or doing something that's quiet and relaxing for 10 or 15 minutes, it's important to have a regular routine," Paruthi said. Limiting screen time before bed is also important, as the blue light emitted from electronics can disrupt our internal clock and make it difficult to fall asleep.